Lice are highly contagious and have a reputation for spreading quickly in places like schools and daycare. Lice is spread by head-to-head contact and by sharing personal items, not because you are dirty. The best way to get rid of lice is by acting quickly and being thorough. Call it a rite of passage or a nightmare, every parent dreads the day when they find that first telltale lice nit in their child’s hair. The combing and laundry that follows are enough to make any parent go weak at the knees. Although relatively harmless, a louse’s (singular for lice) will to survive makes it a formidable foe. So if this unwelcome visitor shows up at your house, here is what you need to know. Although the idea of a tiny parasite feeding off the blood drawn from your scalp is repulsive, lice are harmless and generally only cause unpleasant itching. But you will want to get rid of them quickly before they have a chance to spread. Lice are highly contagious and have a reputation for spreading quickly in places like schools and daycare. You don’t have to worry about them flying or jumping on you, but they are spread by sharing clothing, combs, pillowcases, hats or by head-to-head contact. The good news is that your pets can’t catch lice, so you don’t have to worry about them spreading it. The bad news is that they can live for up to two days off of somebody’s head. Having lice can be embarrassing, so let children know that it isn’t their fault and that they aren’t in trouble. You can make some of the delousing more attractive by bribing them with screen time or other rewards. If your child’s head starts itching or if the school notifies you of a lice outbreak, you will want to start checking your child’s scalp for signs of lice. It is also not a bad idea to keep an eye out by regularly helping your children comb their hair. Adult lice are about the size of a sesame seed and either a tan or grey color, but you will usually spot their eggs first. Lice attach their eggs to your hair shaft close to your scalp. It looks like dandruff, but you won’t be able to brush it off. The best way to look for them is by dividing your child’s hair into sections and to slowly go through each section around the scalp, behind the ears, and at the nape of the neck with a fine-toothed comb. If you are having a hard time seeing anything, a bright light or magnifying glass can help. We often think that itching will be the first sign of lice, but that isn’t always the case. Some people are less sensitive to them than others and might not feel it. If your child has lice, you will want to let your school know and find out what your school’s policy is. Let your child know that they should be careful to avoid head-to-head contact and not to share personal items. Not only do you not want other children to get it, but if your child spreads it to others, your child is more likely to catch it again. 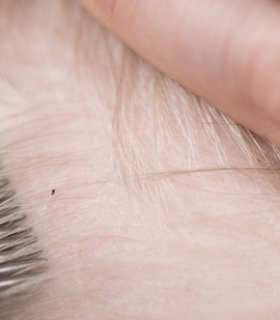 Treating lice is most effective with a three-pronged attack. Medication: First you will want to try a medicated shampoo or lotion to kill the lice. Remember that this isn’t just a normal shampoo, but a medication. You will want to be careful that the shampoo is appropriate for your child’s age and that you follow the instructions carefully. Using too much or too often can be harmful to your child. Combing: After using the medication, you will want to comb out the nits and any lice with a fine-toothed comb. First wet and condition your child’s hair and divide it into sections. The water and conditioner will help immobilize the lice and make it easier to comb through your child’s hair. You will want to do this every week for at least three weeks. It is a lot of work, but it is important to do it carefully if you want to get rid of them all. For children two months and under, you will want to only use the comb out method because they are not old enough to use the medicated treatments. Parents with older children may also try the comb out method first before trying medication. Delousing the house: Next you will want to make sure the lice don’t come back by delousing your house. Wash all your bed linens and clothing that have come in contact with the infected person in water that is over 130F. Items should then be placed in the dryer for at least 20 minutes. If an item can’t go in the washer, place it in an airtight bag for at least three days. All carpet, rugs, and upholstery should also be vacuumed and the vacuum cleaner bag should be thrown away or for bagless vacuums you should clean out the filter well. Soak any hair accessories and hairbrushes in the medicated shampoo or rubbing alcohol or just throw them away. Lice can be tricky to get rid of, especially if you aren’t careful to get all the nits or if your child is still being exposed to somebody with lice. If your child still has lice after two weeks, call your doctor. You may need to try another method or a prescription medication. If your child’s scalp becomes irritated or infected from scratching, you will also want to see your doctor. Getting lice doesn’t mean you are dirty, just unlucky. Washing your children’s hair every day won’t make them less likely to get lice. However, your children should know that it is a good idea not to share personal items like hats, hair ties, helmets, or brushes. They should also avoid head-to-head contact. If you have been in contact with somebody who has lice, you will want to examine family members closely every few days. Don’t use a hair dryer when applying medications. Some of the medications have flammable ingredients or the hair dryer could blow the lice onto bystanders. There are no studies that show that using a special electric comb will kill lice or get rid of the nits. Using petroleum jelly, olive oil, or mayonnaise to suffocate the lice doesn’t always work. So it might not be worth the effort to wash it out. And definitely don’t use gasoline or kerosene—they are highly flammable and dangerous. Don’t use more than one medication at a time. And if your current medication does not seem to be working after three uses, talk to your doctor.